Here's a map thread for maps I do. My first completed map. No gimmicks, I generated a random map using the game and then approximated elements I liked from it. So the idea is that it's a 'Random' map without the randomness. Several gameplay tests and appropriate overhauls later, and here it is. Screenshot shows the distances between planets. My SteamID - Let's have a game! Mayhem Intergalactic Steam Group - Let's have a bigger game! That also looks like a very interesting map. For the record, I don't think the aesthetics are bad at all. Wow, it's been a year! I still play this game... It remains one of my top 5 favorite indy games of all time, some days it's easily my most favorite. I wonder sometimes if Chris is still making games. I say that to no one in particular because the forum is clearly dead and there's no telling how long it will be until he sees this message. You can tell from the distances screenshot that it's quite a chaotic map, exactly the kind of mayhem this game's title promises. 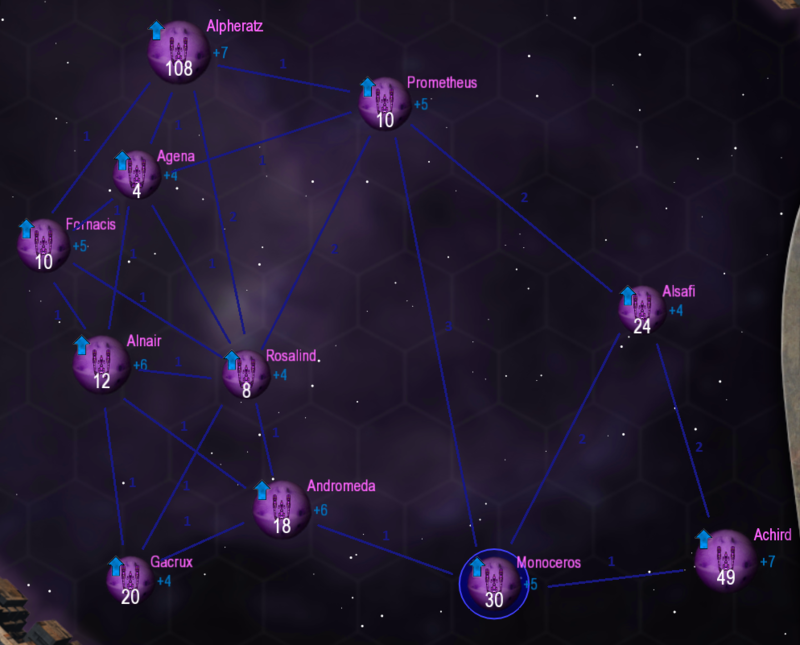 description=A tight cluster of strategic planets with many battlegrounds. Nearly overwhelming micromanagement. Can you keep solid command of your entire fleet? Remember: The enemy's gate is down. I seem to be having trouble attaching the screenshots, so here's some imgur links. I don't know how long they stay on imgur before they are purged. Screenshot showing distances and base production values. Not so long. Hey Minus! That's awesome that you still play. I don't think there are a lot of people playing it these days, though I still get a handful of sales every month, so it's not totally dead. Not a lot of forum activity, obviously. I still check the forums every day. My intention is to keep supporting the game for as long as that's still possible. I have another patch half-completed that I've been slowly working on (fixes the audio crackles some people were having, adds the UI feature request to have Ctrl+drag and Ctrl+rightclick set rally points, some other bits and pieces). Remember: The enemy's gate is down. I was just demoing the game for a friend, and decided to check in on the forums. I haven't been playing much, but send me a message on steam if your ever up for a match. The new map looks cool minus! I've been busy working on a fighting game and online file storage system, so I haven't been playing much on steam recently. * "Cool" is defined as the period of time in which Kumlekar plays a game.